One of our founders dad was out of town on business and was in a minor car accident. To treat some of the injuries from that accident, he was in a hospital. As the Doctors did not have any information about his medical history and without his permission administered a medication he was allergic too. That had an adverse reaction and he was hospitalized for couple of days leading to his death. That incident and countless other similar mishaps that take place every single day in medical emergencies all over the world have led us to develop iMediChart. iMediChart helps our subscribers plan logically their medical data , so that they can reduce or eliminate medical mistakes in emergencies and during regular Doctor visits. 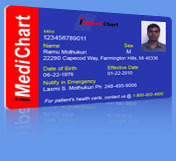 All of us at one point or the other need access to our personal medical info that can help us in our medical treatment. Some times it is in emergency room and some times it could be during your routine Doctor visits. In case of Emergencies, it is paramount to have your personal medical info handy. Most of the times, the Emergency rooms have to call your loved ones to get your medical information. It is possible your loved ones may not be able to provide all the info needed to help you in your treatment. There could be very little time for them to gather that information and pass it on to the Emergency medical staff. That can lead to wrong treatment or delayed treatment to you, thus putting your life in danger. If you can store all your information on a secure website like ours, it is possible we can supply your information to the medical staff at a very short notice. As the information is accessed through the web, you can retrieve it from any where in the world at any time of the day. We sincerely hope iMediChart can provide peace of mind and save some lives.